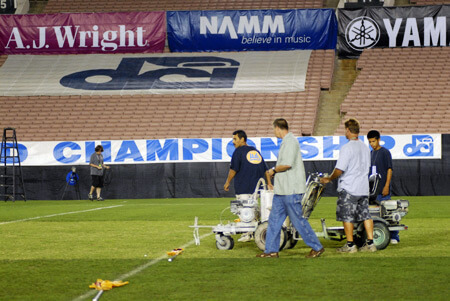 Brief controversy was sparked during the 2007 Drum Corps International World Championship Quarterfinals on Aug. 9, when director George Hopkins, concerned for the safety of his corps performers, indicated that the hash marks were not visible on the field prior to his corps' performance. A 15 minute delay followed until the lines were repainted at Rose Bowl Stadium. A Rose Bowl Stadium field crew re-paints the hashes during an unscheduled break. All corps directors agreed at a Wednesday night meeting in preparation for the DCI World Championships that the field painting schedule would allow for the lines and hashes to be refreshed only during each of the scheduled breaks. Based on that agreement the initial reaction of Drum Corps International Contest Director Tony DiCarlo, the Cadets were penalized two points for delay of contest. As all facts came forth, however, it was clear that while the yard lines were painted during the second break the hash marks had not been. "At no time was Mr. Hopkins anything but respectful of the contest director and the situation. After reviewing all facts in the matter, Judge Administrator John Philips, Contest Director Tony DiCarlo, and myself determined that it was in the best interest of all parties involved in the competition to withdraw the penalty," said DCI Executive Director Dan Acheson. Turf managers at the Rose Bowl Stadium were quick to respond to the situation and have agreed to a more frequent painting schedule which will eliminate similar issues for the remaining nights of Division I competition. 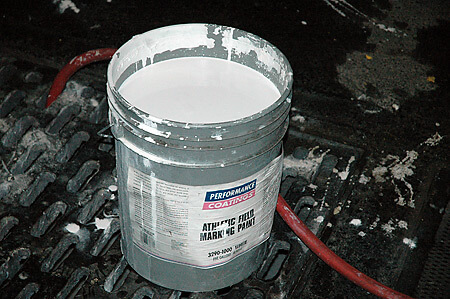 Extra field paint is mixed in preparation for more frequent lining during Friday and Saturday events. "Drum Corps International would like to formally apologize to the members of the Cadets, their staff and their fans for any misconception based on actions of Thursday evening," said Acheson. "All decisions were made on strict interpretation of the rules, but once the facts were in, the withdrawal of the penalty was seen as the appropriate option."